Tibet has scenery worthy of any National Geographic Front Page. It is the land of high-altitude Snow Mountains, stunning crystal-clear turquoise lakes, ancient monasteries, and lush valleys. Vast plains stretch out for hundreds of kilometers in all directions. The homes of the world’s rarest wildlife like wild asses, rare Tibetan antelopes, and the wild yaks that are the progenitors of the modern domesticated hybrids called “yaks” in Tibet these days. The unique Tibetan people are friendly and pleasant, devoted to their unique version of Buddhism. It has been the main religion on the plateau for more than 1,300 years. And if that was not enough to get you wondering how to get to Tibet, then you should know that it is the best place to go for viewing the world’s highest mountain, Mount Everest, at close quarters. Tibet is known variously as “The Roof of the World”, “The Land of Snows”, and “The Third Pole”. It is a vast place, despite appearing to be dwarfed by the rest of China. At around two-thirds the size of Western Europe. Tibet is a colossal place to visit, and travelers can spend days getting from one place to another. And that is just the area known as the Tibet Autonomous Region. But the ancient Tibetan Empire stretched far into the modern-day Chinese provinces of Qinghai, Sichuan, Gansu, and Yunnan Provinces of China. Tibetan autonomous prefectures now exist in these provinces. With a unique history that dates back thousands of years. Tibet is undoubtedly one of the most awe-inspiring places to travel to. The landscape of Tibet, as well as the people, buildings, and just about everything else, is automatically very photogenic. While Switzerland and maybe New Zealand may come close to having landscapes and scenery that can almost equal that of the plateau. Tibet has a deeper and wilder aspect to it that makes it the most breathtakingly beautiful place on the planet. Dramatic white clouds drift across an azure-blue sky and reflected perfectly in crystal clear lakes of turquoise waters. These are surrounded by immense mountains that spear the skies, with the vast and ancient glaciers carving grooves in their even older flanks. And all this is before you even visit the Great Three Holy Lakes of Tibet. Everywhere you travel to Tibet, you will be faced with one of the most stunning potential photographs you have ever imagined. Take a walk around the forbidden city of Lhasa, the Tibetan capital. You will come across the landmark of Lhasa, the Potala Palace and the famous Jokhang Temple. It is the most sacred temple in Buddhism. Built in the 7th century, this ancient Buddhist shrine is the perfect backdrop for the throngs of devoted Tibetan Buddhists that make their way around the “kora” route of the temple, a religious prayer pilgrimage, often culminating with hundreds of prostrations in front of the gates of the Jokhang. Culture and religion in Tibet go hand in hand, and could even be said to be the same thing. The unique Tibetan culture is one with their devout faith in the Buddhist beliefs and scriptures, and even the traditional clothing of the Tibetan people has a unique significance, instead of just being works of colorful art. The clothing can tell you where the person is from in Tibet and whether they are a farmer or nomadic herder. 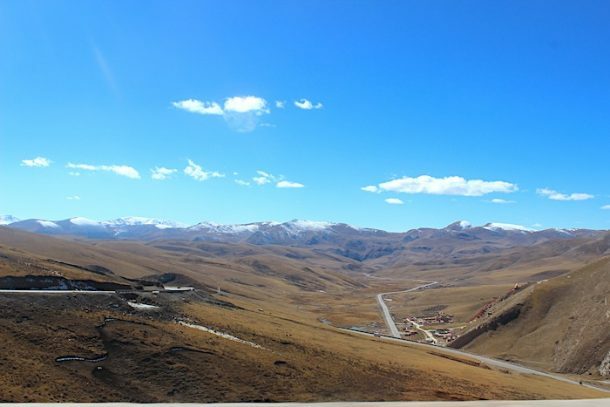 Tibetan culture is also heavily influenced by the unique landscape and climate of the Tibetan plateau. The way of life has developed in a way that has allowed the Tibetan people to thrive and build empires on the most inhospitable region of the planet for more than 15,000 years. The main religion in Tibet is Tibetan Buddhism, a variant of Vajrayana Buddhism that has developed on the plateau after Buddhism was first introduced to Tibet in the 7th century. It was the adoption of Buddhism by the Tibetan king, Songtsen Gampo, which resulted in the hundreds of monasteries that can now be found across the plateau region. During later centuries, the Buddhist faith became a major part of the Tibetan way of life, and to this day. It is almost every aspect of Tibetan daily life is centered on their unique religion. Tibetan cuisine is a style of cooking that has developed in the region based on the available foods and ingredients, as well as the high-altitude landscape. Yaks have long been the main source of meat and dairy products. With yak meat being the tasty and tender heart of many dishes, with yogurt as the most eaten dessert on the plateau. In fact, yogurt is so popular it even has its own festival! Noodles are also a popular ingredient in dishes, as are mutton and vegetables. It is interesting to know that Tibetans do not eat fish, despite the lakes and rivers being filled with them. The stable food of Tibet. As they are considered to be the incarnation of the water deity, and with water burial being a popular type of funeral, the fish dispose of the earthly corpse. 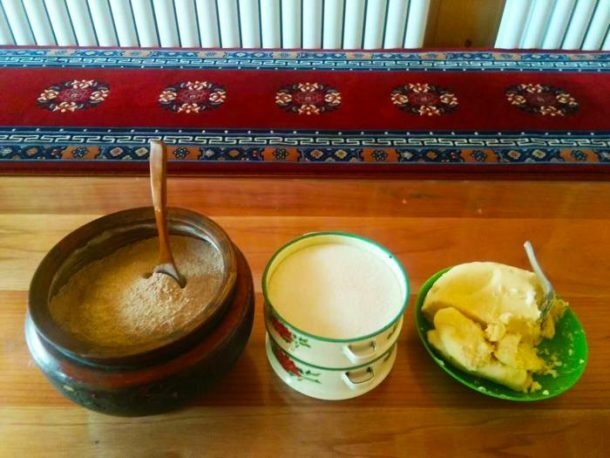 Butter tea, or “Bo cha” is the common beverage of the plateau, and the delicious brew is drunk all day long by Tibetans. They are even known to keep their own tea bowl in the folds of their clothes, always ready for use. Made from black tea and salty yak butter, this drink is not to everyone’s taste, but it is definitely worth trying. Alongside the tea, you will always find the delicious tsampa, a ball of pastry dough made from roasted highland barley flour and the remnants of the last bowl of tea. With the last of the tea, you add a small handful of the flour and mix it together, rolling it around the bowl to get around the dough-like ball, which you then pop in your mouth and eat. Bo cha and tsampa go together in much the same way as tea and scones in the United Kingdom or cheese and wine in France. Is it easy to get into Tibet? 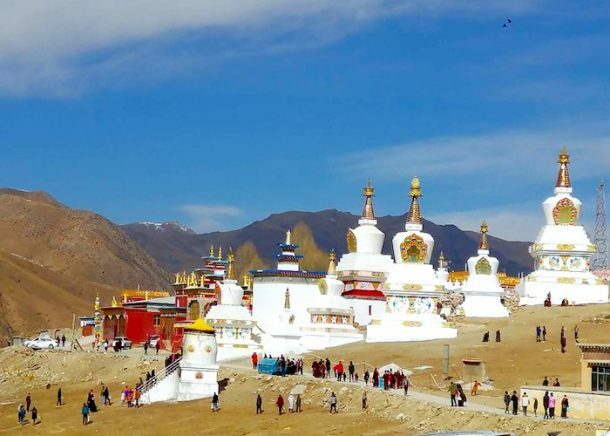 Many people will tell you that Tibet is not an easy place to get to, with stringent restrictions on travel, numerous government-issued and required permits that you cannot obtain yourself, and a variety of requirements to just get into China in the first place. While it can seem a little difficult to make all of these arrangements, it really is not. In fact, the only thing you have to arrange yourself is your visa to China, and as long as you do not mention traveling to Tibet, that is relatively easy to obtain. All of the other things you need to get to Tibet are arranged for you by your Tibetan tour operator. Since it is not permitted to travel independently in Tibet. 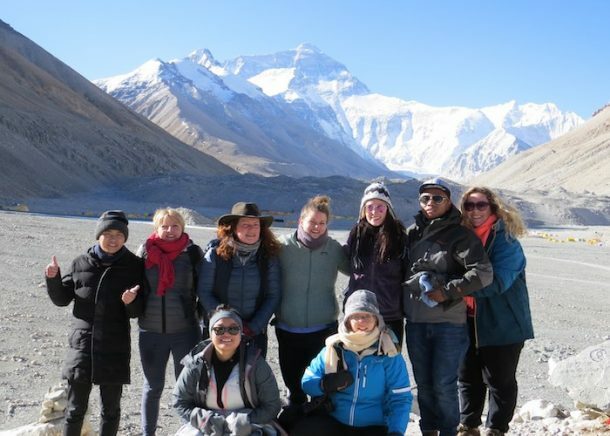 All tourists must use a tour operator, and be on a pre-arranged Tibet tour of the region, complete with the tour guide, driver, and private vehicle. Once you have your visa, simply get in touch with us here at Tibet tour operator, Explore Tibet. And let us know where you want to go and what you want to do, and we will craft an itinerary to suit your needs. We will apply for all the Tibet travel permits you need for Tibet and arrange your accommodation to suit your requirements. Even arrange your travel means from mainland China to Lhasa, the Tibetan capital. So is it really worth traveling thousands of miles to Tibet? Yes, it is. There is nowhere like Tibet on the planet; no people like the unique and friendly Tibetans; no food quite like dried yak meat, tsampa, and tea made from butter. And of course, no landscapes that have such dramatic and majestic vistas; and nowhere else where you can get as good a view of the world’s highest mountain – Mount Everest. So let’s do this together with our help, we can make your travel dream come true by exploring and experiencing the world’s most adventurous travel destinations. Previous postThe Most Prominent Women in Tibetan History Next postHow to Plan a Trip to Tibet?